Background: Venous ulcers are a major problem for patients with chronic venous disease (CVD) such as varicose veins. Its treatment is very complex and requires great care, such that inappropriate responses to various medical and surgical treatment could change this condition. This report aims to provide clinical experiences of Iranian traditional medicine that has been the most effective treatment in the shortest period of time. Case Presentation: Patient is an 85-year-old female with a known history of lower limb varicose for more than twenty five years and hyperlipidaemia, ischemic heart disease (IHD), headache, and fatty liver. She presented complains from severely infected venous ulcer of the right leg, inflamed with damaged skin, which is associated with weakness and fatigue. Patient has been hospitalized and undergone surgery as a result of femoral fractures caused by osteoporosis in right leg in 2015. Venous leg ulcers were observed two weeks prior to the visit. Leg amputation has been suggested for the treatment of foot ulcer by the respective specialist advice, but modern medicine has not started due to lack of patient's satisfaction. Patient has referred to the Ahmadiyyeh Health Center for treatment guided by an acquaintance. Patient has had two ulcers on the right foot with a diameter of 15 cm× 7cm and 2×2cm. Due to clinical examination by traditional medicine doctors and based on Clinical-Etiology-Anatomy-Pathophysiology (CEAP) classification criteria for venous ulcer classification system, they were classified to be equivalent to basic CEAP: C6, S, Ep, a, Pn, respectively. Patient has been treated using health and nutritional measures of traditional medicine after visiting the clinic. Pharmaceutical measures for this case included medicinal herbs, and combinational drugs owing to the nature and condition of the illness. Manual therapies include massage therapy and leech therapy applied around the wound once in a day. After 60 days of treatment, patient's ulcer, physical and mental state had completely improved. Conclusion: Considering the recovery process of patient with the approach of physical force and mental state and a significant improvement in wound, it seems that traditional medicine can pave the way for the treatment of many common diseases while informed assessment of different diseases based on the teachings of traditional medicine seems necessary. Venous ulcers are a major problem for patients with CVD such as varicose veins. About two and a half million American adults are affected by venous ulcers . Venous ulcers of the leg affect more than 600,000 persons in American  and form about 80% of all ulcers in the leg region . Venous ulcers are advanced stages of chronic venous disorders which are developed due to persistently high venous blood pressure, impaired blood circulation, and chronic inflammation of the skin [4-7]. These ulcers are painful and remain long term and their risk of recurrence is about 72% . Venous ulcers reduce quality of life, and cause sleep disorders, stress-induced pain, and restriction of movement, and also involve high economic costs . Despite the expansion of treatments and improvements in the management of these wounds, venous ulcers and recurrence remain a major problem in the elderly  given that the treatment of venous leg ulcers is complicated and needs great care. The strategy of these treatments also requires familiarity with the classifications of treatment of venous leg ulcers. Today, CEAP classification is employed to examine the wound, the wound treatment, and prognosis . Thus far, several therapeutic procedures have been introduced for the treatment of these wounds which include patient education about the upper region of the leg, elastic compression therapy, and surgical procedures, and skin grafts. One of the major problems in the treatment of venous ulcers is impaired wound healing which may require a long time and on the other hand, ulcer recurrence is high. The chronic wounds along with morbidity are also prone to infection such that they may lead to amputation. Treatment of chronic wounds is a medical problem. On the contrary, if the wound becomes infected, which often occurs as a result of different organisms, there is need to identify more types of pathogens. Moreover, many pathogens are resistant to various antibiotics, therefore using antibiotics can be effective in the prevention of resistance to antibiotics and is more accepted by patients, with less cost . Therefore, it was necessary that based on Iranian traditional medicine, new drugs which have the largest therapeutic effect in the shortest period of time should be evaluated and reported scientifically. The patient is an 85-year-old female with a known history of lower limb varicose for more than twenty five years and hyperlipidaemia, IHD, headache, fatty liver. The patient is a housewife, educated in elementary school, residents and born in Tehran, weighing about 60 kg, with height of 160 cm. Patient had complaints of severe infected venous ulcer of the right leg, inflamed and damaged skin, which was associated with weakness and fatigue. Patient has been hospitalized and undergone surgery as a result of femoral fractures caused by osteoporosis of right leg in 2015. About 20 years ago, she has been undergoing gallstone surgery. Patient had observed venous leg ulcers two weeks prior to the visit. Leg amputation has been suggested for the treatment of foot ulcer by the respective specialist advice, but modern medicine has not started due to lack of patient's satisfaction. Patient had referred to the Ahmadiyyeh Health Center for treatment guided by an acquaintance. Patient was treating with oral tablets of sodium valproate 200 mg once daily and furosemide 40 mg once daily and atorvastatin 20 mg once daily and modified release nitroglycerin 2.6 tablet once daily, ASA 80 mg tablet once a day and ferrous sulfate tablet once a day. Patient has cardiovascular risk factors, including 1) 15-year-old hyperlipidemia treated with atorvastatin 20 mg once a day, 2) lack of appropriate exercise. The patient's vital signs included: temperature: 38°C, respiratory rate of 18 breaths per minute, pulse rate of 90 beats per minute, systolic blood pressure of 110 mm Hg, and diastolic blood pressure of 70 mmHg. Patients have two ulcers on the right leg with diameters of 7×15 cm and 2×2cm. Due to clinical examination by traditional medicine doctors and based on CEAP classification criteria for venous ulcer classification system, they were classified to be equivalent to basic CEAP: C6, S, Ep, a, Pn, respectively. In other words, patient had an infectious wound in the right leg with severe inflammation and swelling which continued near the knee. The wound was initially small which became enlarged with time due to lack of treatment. The patient also suffered from anxiety and depression due to the awareness of the amputation of her right leg as a result of an infection and inflammation of the wound which causes grogginess and palpitations. In other examinations, there were hamstring muscles in both sides, especially the right side, gastrocnemius in both sides, and cramps in trapezius in left side. The patient didn’t observe correct nutritional practices in terms of prevention and hygiene, in other words, she didn’t observe the recommendations of physicians regarding abstinence and the principles of health protection. At the time of admission, patient had no condition in terms of general condition, and also had weakness of physical forces, fatigue and intense anxiety. Her health temperament was cold and dry (soda) and a little cold and wet (phlegm), and this temperament was due to her age, habits, and ulcers which infected her. According to traditional medicine, the patient was out of balance in terms of her temperament and due to her age, she had severely reduced physical force. For this reason, before any intervention, the patient was required to rebuild her physical forces. In other words, the patients’ childhood temperament seemed hot and wet while she had overcome melancholy and phlegm in the current temperament which included physically bad melancholy temperament (cold and dry) and phlegm (cold and more) in organ and whole body. In terms of the six essential principles of health in the Iranian traditional medicine, she does not have very good history and didn’t carry out safe health practices. In physical terms, she was pale and weak. At the touch of the patient's body, she was more cold and dry and in her sick organ also more cold and dry. Patient's pulse was weak and slow. In mental and neurological terms, she seemed extremely anxious that this was more of a melancholy accumulation. The patient also complained of catarrh. The measures of traditional medicine for this patient included protecting the health and nutrition, medicinal plants and manual treatments such as Hirudo medicinalis, massage, honey therapy, poultice, sits bath, daily and continuous washing, if needed the wounds are debrided. The treatment measures were started on patient from 11/09/2016. In the first session, according to the diagnosis, nutritional advice and recommendations of the six essential principles were presented. For the correct nutrition, the patient was advised to avoid eating cold and dry foods and cold and wet foods. Given the weakness of physical force in patient, she was advised to eat nutritious foods and at the same time necessary explanations were given to the patient to comply with the six essential principles. Chamomile, thyme extract and valerian were prescribed as laxative for melancholy and phlegm. Apart from the purpose of reforming the mood, these plants were also used for health as anti-inflammatory, antiseptic, wound drying etc. In addition, saffron and cardamom and rosewater were utilized to strengthen the, antiseptic, sedative, and teasing powers of these plants. Overall, herbal treatment in venous ulcer disease is a complex and very effective process and arrangement of these plants is very important as single or combination which is different for each patient. The patient was also advised to dress the wound with honey once a day from night until morning. Poultice barley, chamomile, mallow were used to clean the wound twice a day and sits bath with hollyhock, mallow, yarrow, chamomile and abulkhalsa were administered once a day. 1. Massage of the patient's legs from top to bottom was recommended once a night. In these patients, massage can increase blood flow, repair tissue, and help to remove bad mood which has been accepted in the area of traditional medicine and modern medicine. Only in traditional medicine, massage should be carried out according to the type of ill-tempered and physical forces present in this patient, the patient's leg massage was done once every night at the end of treatment. 2. Leeches therapy around the wound at one meeting with 3 small leeches for 3 weeks of treatment. In this patient, due to the physical conditions, advanced age, and the harsh conditions for displacement and economic issues, only one session of Hirudo medicinalis was performed. With regard to treatment methods, the patient's general condition was significantly improved after the third week such that weakness, dizziness, and stress were reduced and anxiety wasn’t observed. Vital signs were recorded within normal limits. After a few days of treatment, granulation in the wound was observed in the tissue and this trend was accelerated by the use of Hirudo medicinalis such that ulcer and inflammation and infection of the right leg were fully recovered within two months. The patient was followed for 1 month and no recurrence was observed. Venous ulcers are one of the biggest problems of patients who have chronic venous disorders, CVD such as varicose veins. Venous ulcers reduce quality of life, sleep disorders, stress-induced pain, and restriction of movement and provide enormous economic costs . On the other hand, ulcer recurrence is high and consequently, we need more effective and less costly therapies. Due to the high cost of treatment and long-term hospitalization and possibly amputation, different methods have been employed all over the world to treat the wound and new therapies have also being explored , which has also been assessed in the present study. 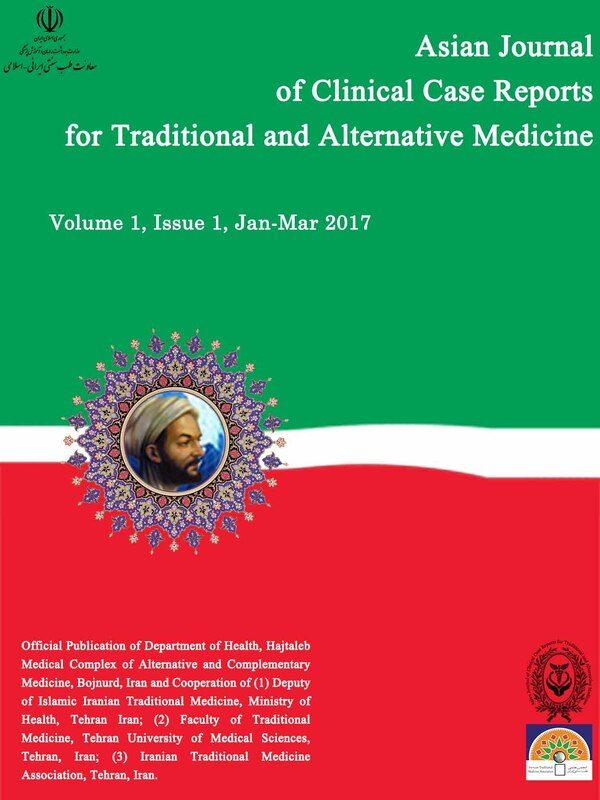 In this report, an attempt has been made to use Iranian traditional medicine to develop an effective and affordable treatment for health maintenance and for the use of our patient and it was reported scientifically. In summary, it can be said that explanation of the causes of traditional medicine for wounds healing is related to the ulcers with secretions. Based on evidences available in traditional medicine books, the weakness of the organs, and ill-temper play vital roles in wounding and the use of appropriate diets, poultice, sits bath, phlebotomy, bloodletting and leeches are common in the treatment of wounds. These patients can be helped by traditional medicine. In this study, nutritional advices and recommendations of the six essential principles were presented for the patient to learn and upholding the principles of feeding practices in traditional medicine can help in treatment procedure. In Iranian traditional medicine, the drugs are used for healing the wounds cleaning the ulcer, removing the ill-temper of the organ, and strengthening the organs. In this study, herbs with mentioned effects such as chamomile, mallow, and yarrow have been used. In summary, the use of plant for the treatment of wound is a complex and at the same time very effective task and arrangement of these plants as single or combined is very important which is different for each patient. Studies have been conducted on the effectiveness of plants mentioned as the sources of new medicine. Different studies have been conducted on the effectiveness of Chamomile plant on wound in which various anti-inflammatory pathways and re-epithelialization have been evaluated [14-18]. In addition, some studies have been carried out on the effect of Mallow on peptic ulcer [19-20] and the effect of grain has also been studied in gastric ulcers in rats . Several studies have also been conducted on the positive effect of Yarrow on wound healing [22-24]. Studies have also been published on the effects of leech therapy in the treatment of vascular disorders and wound healing [25-26]. Honey has been used in the treatment of wounds for a very long time. Studies have been published regarding the effect of honey in wound treatment [27-31]. In this patient, the patient's bandages have accelerated wound healing process and no infection was observed in the wound. At the end, complementary medicine can be used to achieve a cheaper treatment with low side effect, and more effective progress. Iranian traditional medicine as a medical school can have effective clinical findings in treating some diseases such as venous leg ulcer disease. In the treatment of wounds, Iranian traditional medicine causes less spending and reduces the use of antibiotics in patients. Therefore, according to the principles of Iranian traditional medicine, it can be investigated and evaluated as a new non-invasive treatment which has the largest therapeutic effect in the shortest period of time. This paper presents the results of therapeutic activities of Doctor Seyyed Mohammadali Soroushzadeh. Dr. Mehrdad Karimi advised and contributed in this article. The authors would like to appreciate the cooperation of the patient and her families for participating in this study and completing the patient care process. Unsparing efforts of Dr. Mehrdad Karimi in the treatment process is also appreciated. Valencia IC, Falabella A, Kirsner RS, Eaglstein WH. Chronic venous insufficiency and venous leg ulceration. J Am Acad Dermatol. 2001; 44(3): 401-21. Bowman PH, Hogan DJ. Leg ulcers: a common problem with sometimes uncommon etiologies. Geriatrics. 1999; 54(3): 43-50. Phillips T, Stanton B, Provan A, Lew R. A study of the impact of leg ulcers on quality of life: financial, social, and psychologic implications. J Am Acad Dermatol. 1994; 31(1): 49-53. Abularrage CJ, Sidawy AN, Aidinian G, Singh N, Weiswasser JM, Arora S. Evaluation of the microcirculation in vascular disease. J Vasc Surg. 2005; 42(3): 574-81. Bergan JJ, Schmid-Schönbein GW, Smith PD, Nicolaides AN, Boisseau MR, Eklof B. Chronic venous disease. N Engl J Med. 2006 Aug 3; 355(5):488-98. Coleridge Smith P. The causes of skin damage and leg ulceration in chronic venous disease. Int J Low Extrem Wounds 2006; 5(4):160-68. Pascarella L, Schönbein GW, Bergan JJ. Microcirculation and venous ulcers: a review. Ann Vasc Surg. 2005; 19(6): 921-7. Reichenberg J, Davis M. Venous ulcers. Semin Cutan Med Surg. 2005; 24(4): 216-26. DeCotiis M, Konz EC. Minimizing complications of pain and dressing adherence in the treatment of venous leg ulcers. Ostomy Wound Manage 2008; 54(2):12-16. Sayre EK, Kelechi TJ, Neal D. Sudden increase in skin temperature predicts venous ulcers: a case study. J Vasc Nurs. 2007; 25(3): 46-50. Eklöf B1, Rutherford RB, Bergan JJ, Carpentier PH, Gloviczki P, Kistner RL, et al; American Venous Forum International Ad Hoc Committee for Revision of the CEAP Classification. Revision of the CEAP classification for chronic venous disorders: consensus statement. J Vasc Surg. 2004; 40(6): 1248-52. O'Meara S1, Al-Kurdi D, Ologun Y, Ovington LG, Martyn-St James M, Richardson R. Antibiotics and antiseptics for venous leg ulcers. Cochrane Database Syst Rev. 2014 Jan 10; (1):CD003557. Kalish J, Hamdan A. Management of diabetic foot problems. J Vasc surg 2010; 51(2):476-86. Oliveira BV, Barros Silva PG, Nojosa Jde S, Brizeno LA, Ferreira JM, Sousa FB, et al. TNF-alpha expression, evaluation of collagen, and TUNEL of Matricaria recutita L. extract and triamcinolone on oral ulcer in diabetic rats. J Appl Oral Sci. 2016; 24(3): 278-90. Cemek M, Yilmaz E, Büyükokuroğlu ME. Protective effect of Matricaria chamomilla on ethanol-induced acute gastric mucosal injury in rats. Pharm Biol. 2010; 48(7): 757-63. Charousaei F, Dabirian A, Mojab F. Using chamomile solution or a 1% topical hydrocortisone ointment in the management of peristomal skin lesions in colostomy patients: results of a controlled clinical study. Ostomy Wound Manage 2011; 57(3):28-36. Duarte CM, Quirino MR, Patrocínio MC, Anbinder AL. Effects of Chamomilla recutita (L.) on oral wound healing in rats. Med Oral Patol Oral Cir Bucal. 2011 Sep 1; 16(6):e716-21. Al-Hashem FH. Gastroprotective effects of aqueous extract of Chamomilla recutita against ethanol-induced gastric ulcers. Saudi Med J. 2010; 31(11): 1211-6. Hage-Sleiman R1, Mroueh M, Daher CF. Pharmacological evaluation of aqueous extract of Althaea officinalis flower grown in Lebanon. Pharm Biol. 2011; 49(3): 327-33. Zaghlool SS, Shehata BA, Abo-Seif AA, Abd El-Latif HA. Protective effects of ginger and marshmallow extracts on indomethacin-induced peptic ulcer in rats. J Nat Sci Biol Med 2015; 6(2): 421-28. Yoshizawa M, Yokoyama K, Nakano Y, Nakamura H. Protective effects of barley and its hydrolysates on gastric stress ulcer in rats. Yakugaku Zasshi. 2004; 124(8): 571-5. Potrich FB, Allemand A, da Silva LM, Dos Santos AC, Baggio CH, Freitas CS, et al. Antiulcerogenic activity of hydroalcoholic extract of Achillea millefolium L.: involvement of the antioxidant system. J Ethnopharmacol. 2010 Jul 6; 130(1): 85-92. Abd-Alla HI, Shalaby NM, Hamed MA, El-Rigal NS, Al-Ghamdi SN, Bouajila J. Phytochemical composition, protective and therapeutic effect on gastric ulcer and amylase inhibitory activity of Achillea biebersteinii Afan. Arch Pharm Res 2016; 39(2):10-20. Nemeth E, Bernath J. Biological activities of yarrow species (Achillea spp.). Curr Pharm Des 2008; 14(29):3151-67. Bapat RD, Acharya BS, Juvekar S, Dahanukar SA. Leech therapy for complicated varicose veins. Indian J Med Res. 1998 Jun; 107: 281-4. Zaidi SM. Unani treatment and leech therapy saved the diabetic foot of a patient from amputation. Int Wound J 2016; 13(3):263-64. Gethin G, Cowman S, Kolbach DN. Debridement for venous leg ulcers. Cochrane Database Syst Rev. 2015 Sep 14; (9):CD008599. Holland LC, Norris JM. Medical grade honey in the management of chronic venous leg ulcers. Int J Surg 2015; 20(1):17-20. Jull AB, Cullum N, Dumville JC, Westby MJ, Deshpande S, Walker N. Honey as a topical treatment for wounds. Cochrane Database Syst Rev. 2015 Mar 6;(3):CD005083. Mayer A, Slezak V, Takac P, Olejnik J, Majtan J. Treatment of non-healing leg ulcers with honeydew honey. J Tissue Viability. 2014; 23(3): 94-7. Jull AB, Walker N, Deshpande S. Honey as a topical treatment for wounds. Cochrane Database Syst Rev. 2013 Feb 28; (2):CD005083.